Women's start preparing Bathukamma from the afternoon. Local seasonal flowers mainly tangedi, gunuka, alli, katla and more. They cut the flowers leaving the little length base, some dip in colors, some scented and arrange them on a wide plate called tambalamu, and stack them up in a conical mount, like a cone. The flowers arranged in five, seven and more concentric columns and rows decorated with a pumpkin flower on top of the stack. In the evening Women and young girls celebrate the festival dressed up in traditional pattu saris, half Saris and Dresses and wear jewelry. After that gather in large numbers with their Bathukamma in their locality, place them in the middle and clap, Sing and dance around them in small circles. After singing and dancing around for hours, Bathukamma are taken to a lake or a pond then set afloat in the water. In olden days Goddess Durga Devi fought with demon Mahishasura has been tired on Aswiyuja padyami became unconsciousness. Then women start prayed Durga Devi as Bathukamma with the songs and Devi became consciousness on Vijayadashami. So,because of this reason every year women will celebrate Bathukamma every year. On the last day of Bathukamma women also prepare different varieties of food mainly pulihora, daddojanam and Maleeda along with Bathukamma after singing and dancing near the pond they will share the food with each other and leave the place with joy and happiness. Bathukamma festival gives the importance of the relationship between human beings. One of the most important Bathkamma festival rituals is held at the Bhadrakali Temple in Warangal. Bathukamma festival is celebrated by all the people without the difference of Poor, rich and caste. The festival shows the relation of Earth, Water and Humans. are used for treating of infected sores. Marigold బంతి Marigold is a potent antiseptic herb. face for the flowers' soothing, cooling properties. anti-inflammatory and an anti-bacterial agent. Luffa బీర పువ్వు Roots is used for dropsy and as a laxative. The leaves are used to treat jaundice. cure fresh wounds, to stop bleeding, as a hair tonic. Bathukamma is a colourful floral festival celebrated by hindu women in Telangana state with exotic flowers of the region that are available in the season. Bathukamma festival has a history of over years which has now became a symbol of Telangana culture and identity. Bathukamma festival comes during the latter half of monsoon, before the onset of winter. Vemulavaada Chalukya kings were sub-feudatories of Raastrakoota kings. In the wars between Chola kings and Raastrakootas these Chalukyas sided the Raastrakootas. In 973 AD Rastrakoota sub-feudal lord Tailapudu-2 defeated the last king Karkudu-2 and established independent Kalyani Chalukya kingdom. The present Telangana region was under his authority. 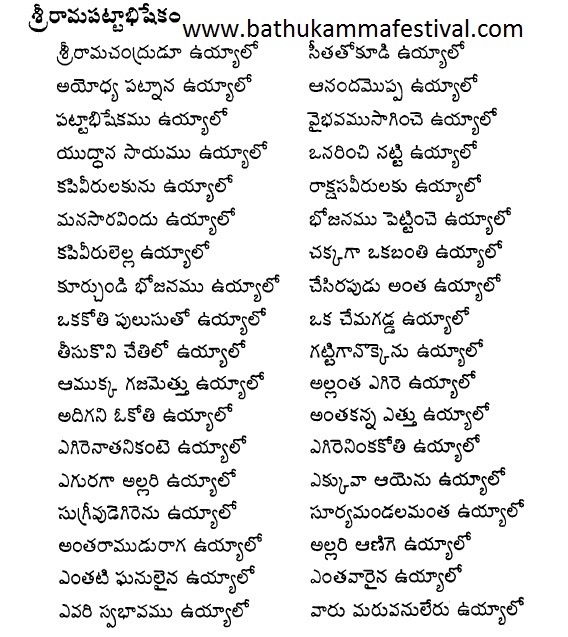 After the death of Tailapudu-2 in 997 AD his son Satyaasrayudu became the king. In the erstwhile kingdom of Vemulavaada (present Karimnagar District), Rajarajeswara temple is popular. Rajarajeswara received worship from Telangana people as their beloved deity. Chola king, Paraantaka Sundara Chola was in troubles while defending the attack from Raastrakoota kings. Learning that Rajarajeswara will help those in troubles Paraantaka chola turned as his devotee. Also, he named his son as Raja Raja. This is evident from Arikesari epigraph. Raja Raja Chola ruled between 985-1014 AD. His son Rajendra Chola attacked as a Chief of Army and stood victorious on Satyaasraya. As a sign of his victory he destroyed Rajeswara’s temple and took the Bruhat (huge) Siva linga to his father as a gift. In 1006 AD Raja Raja Chola had started building a temple to this huge Sivalinga (Brihadeswara). In 1010 AD he installed this Linga. Chola kings also announced in Tamil epigraphs that this Brihadeswara temple is built from the wealth looted in the attack on Vemulavaada Chalukya kingdom. Even now the similarities between the Sivalinga of Vemulavaada Bheemeswaralayam and Sivalinga of Brihadeeswaralayam of Tanjavuru can be seen. Taking away the Sivalinga from Vemulavaada to Tanjavuru downhearted the people of Telangana. After leaving Telangana in the form of Linga, along with an attempt to console Paarvathi (Bruhadamma) in the temple here and to inform sorrowfulness to Cholas, Batukamma is arranged with flowers like Meru mountain. On its top Gouramma made with turmeric is placed and is recounted with sing and play for nine days. Dispatching her in water and calling her back took a shape of a festival. 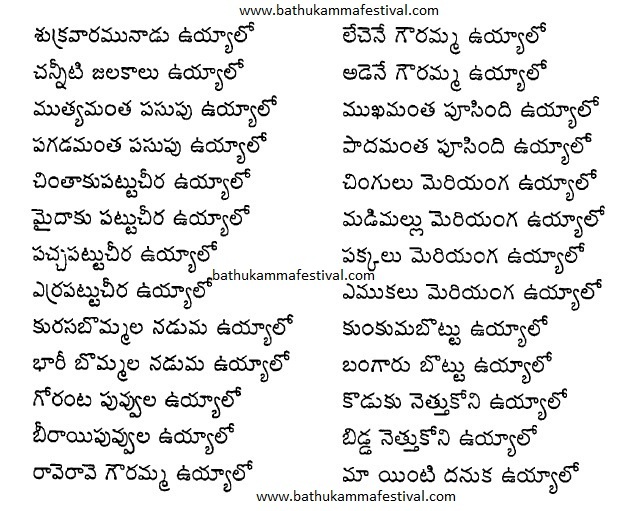 Batukamma name is derived from Bruhadamma. Batukamma festival is a social denouncing movement practiced from 1000 years. Only songs are sung with mother Goddess Parvathi’s name with comforting, who is without Siva. The other version of Bathukamma is that there was a king named Dharmangada and a queen named Satyavati belonging to Chola Dynasty. They lost their hundred sons in the war front. So they prayed and performed ritual to Goddesses Lakshmi to be born as their daughter. The Goddesses heard it and immediately obliged them. On her birth, many scholar and pundits visited the baby at the royal palace and blessed her by calling Bathukamma or live forever. Another version says that Parvathi or Batakamma is a adherent lover of flowers. The seasonal flowers of spring are arranged on a square bamboo frame or square wooden plank with the size of frames that is hardly tapering off to directly form a pinnacle on the top. It looks like the shape of a temple tower or ‘Gopura’. On top of the flowers, a lump of turmeric is kept. The worship of Goddess Batakamma is done with this little floral is mountain. The monsoon rains usually bring plenty of water into the ponds, tanks of Telangana and it is also the time when wild flowers bloom in various vibrant colours across the uncultivated and barren plains of the region. The most abundant of these flowers are ‘gunuka’ (or ‘gunugu’) and ‘tangedu’. There are other flowers like the ‘banti’, ‘chamanti’, ‘nandi-vardhanam’ etc. The ‘shilpakka pandlu’ (or ‘sitaphalalu’), custard apples, are another great attraction during this season. The custard apple is tasty fruit that grows in the wild with little or no water and is often called the ‘poor man’s apple’. Then there is corn (‘jonna’ and ‘mokka jonna’) waiting to be harvested. Amidst these, Bathukamma is celebrated by the womenfolk of Telangana, heralding the beauty of vibrant nature in multitudinous flowers. The festival begins a week before the ‘Saddula Bathukamma’ (the grand finale of the Bathukamma festival) which falls two days before Dassera. The womenfolk normally get back to their parents’ homes from their in-laws and breathe the fresh air of freedom to celebrate the colours of flowers. For one whole week, they make small ‘Bathukammas’, play around them every evening and immerse them in a nearby water pond. On the last day, menfolk of the house go into the wild plains and gather the flowers like ‘gunuka’ and ‘tangedu’. They bring home bagfuls of these flowers and the entire household sits down to arrange them in stacks. The flowers are carefully arranged row after row in a brass plate (called ‘taambalam’) in circular rows and in alternate colours. The Bathukamma grows in size and the bigger it gets the better. The white ‘gunuka’ flowers are coloured using water paints and Bathukamma gets colourful circular layers of them along with ‘tangedu’ in between. The Bathukamma is then placed before the family deity and prayers are offered. As evening approaches the womenfolk dress colourfully in best of their attire and adorn lot of ornaments and place the Batukamma in their courtyard. The women of neighborhood also gather in a large circle around it. They start singing songs by making rounds around them repeatedly, building a beautiful human circle of unity, love, sisterhood. After playing in circles around the ‘Batukammalu’, before the onset of dusk, the womenfolk carry them on their heads and move as a procession towards a bigger water body near the village or town. The procession is extremely glittering with aptly dressed and decorated women and “Bathukammalu”. Songs of folklore are sung in chorus throughout the procession and the streets resonate with them. Finally, when they reach the water pond the ‘Bathukammalu’ are slowly immersed into water after another round of playing and singing. Then they share the ‘maleeda’ (a dessert made with sugar or raw sugar and corn bread) sweets amongst the family members and neighborhood folks. They return to their homes with empty ‘taambaalam’ singing songs in praise of Bathukamma. The songs of Bathukamma echo in the streets until late night during the entire week. Bathukamma is a celebration of the inherent relationship human beings share with earth and water. During the entire preceding week, women make ‘boddemma’ (a deity of Gowri – mother Durga – made with earthly mud) along with Bathukamma and immerse it in the pond. This helps reinforce the ponds and helps it retain more water. The flowers used in Bathukamma have a great quality of purifying water in ponds and tanks and flowers so immersed in abundance are environment friendly. In times when the fresh water ponds are gradually diminishing and dwindling away, it is indeed a matter of pride for Telangana that its womenfolk (with mostly agrarian background) inherently know how to rejuvenate them by celebrating the festival of flowers. The festival heralds the beauty of nature, collective spirit of Telangana people, the indomitable spirit of womenfolk and also the ecological spirit of the agrarian people in preserving the natural resources in a festive way.